William C. Gaines, Harold E. Martin, Miriam Ottenberg, Deborah Nelson, and Buzz Bissinger. What do all of these names have in common? Well, every single one of them has won the Pulitzer Prize award for investigative journalistic achievement. 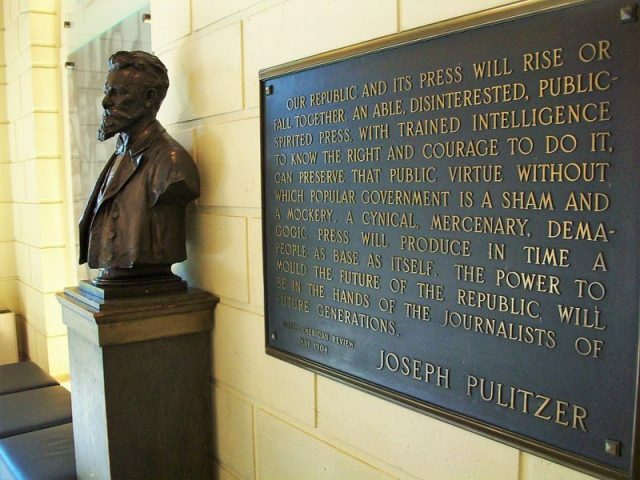 Since its launch in 1917, the Pulitzer Prize has come to be regarded as a prestigious mark of recognition in the fields of journalism and literary arts. There are today 21 categories up for grabs in the annual presentation, with the jury members reserving the right to withhold an award if they believe no submissions in that category reach the standard. To wear the badge of Pulitzer Prize Winner is an accolade that is highly coveted. It is definitely an acknowledgment of serious journalism. But there is a curious part to its inception, and that is the name of the award itself. The “Oscar” of journalism is named after a man who arguably laid the grounds for what would be known later as “yellow journalism,” a sensationalist press that is the predecessor of today’s tabloid news. 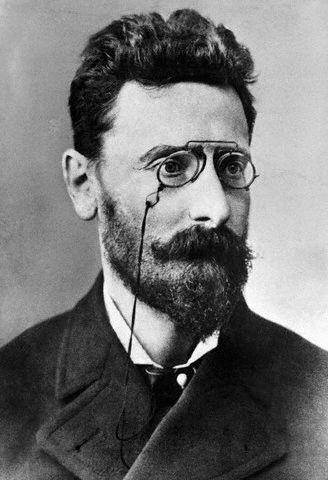 Joseph Pulitzer was born in Hungary and immigrated to the United States as a teenager. He was involved in the newspaper business in 1868, when he started working for the Westliche Post. However, it took some 20 years for him to make a true mark in the field of journalism. By then, he had accumulated enough experience and wealth to own a newspaper; he purchased the New York World for a reported sum of $345,000. With Pulitzer on top, the newspaper thrived and its circulation began breaking records. This was all due to Pulitzer’s knack for appealing to the masses. He knew what the common people wanted to read and he gave it to them. There were legitimate news stories, but also stories ranging from scandalous affairs to street crimes. People gobbled it up; they couldn’t get enough. Every new day had a new story to tell. Pulitzer was active in the Democratic Party and interested in social causes. He recruited the investigative reporter Nellie Bly, who is famous for both her undercover reporting and headline-chasing exploits. 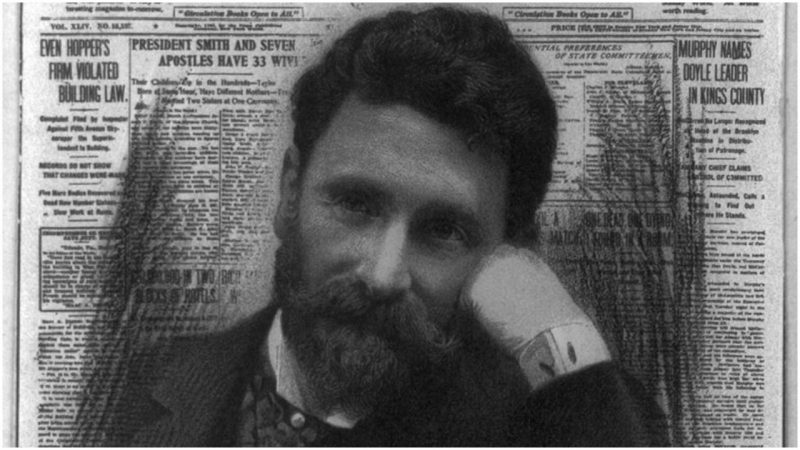 Business was going well for Pulitzer right up until 1895 when William R. Hearst bought the New York Journal and became involved in the same business. This kick-started a great rivalry between them with a single goal in mind: Who would outsell the other. 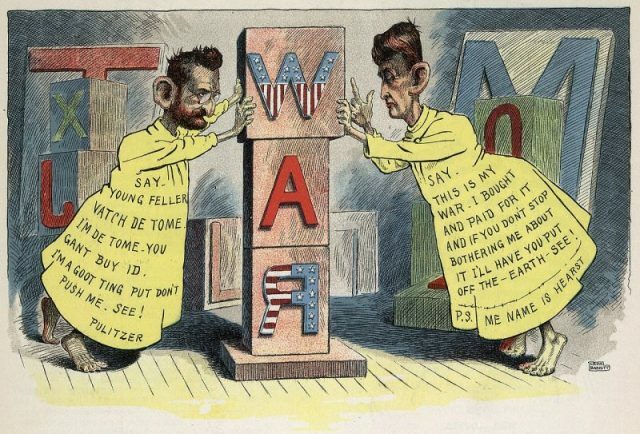 The crime-and-scandal-fueled rivalry soon turned into an all-out circulation war, giving birth to yellow journalism as we know it today. 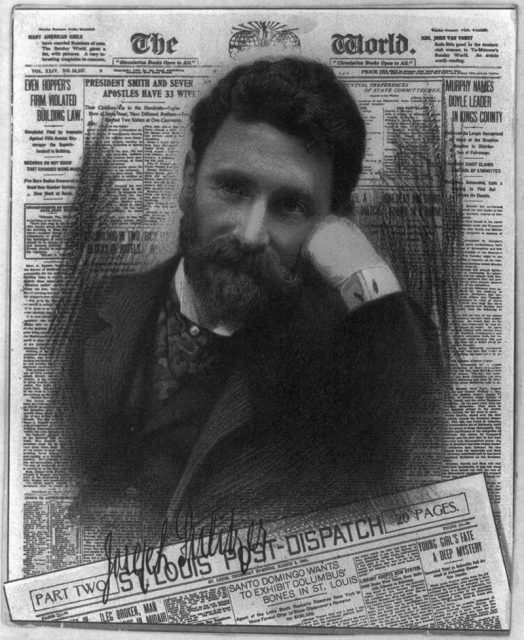 So, in retrospect, if Joseph Pulitzer can be considered the one who set the foundation, then Hearst can be viewed as the one who set the course for the tabloids of the future. Although both newspapers had high circulations, for the critics they were nothing more than low-brow publications. They despised them, especially their methods of reporting and affinity for sensationalism. It was around this period when the term “yellow journalism” became widely known, which brings us to its inception. The term was already in use among journalists and reporters of the era, but it was Erwin Wardman, the then-editor of the New York Press, who published it first. Among peers, especially serious journalists, the term was often used in a derogatory sense for the news that they made fun of. Also introduced by Wardman is another expression that was popular at the time–“yellow kid journalism.” For this phrase, he specifically alluded to the main character in Richard Outcault’s Hogan’s Alley comic strip that was published in the two rival newspapers. The Yellow Kid ran first in Pulitzer’s paper. When Outcault was lured away with a bigger salary by Hearst, Pulitzer hired another cartoonist to continue drawing the cartoon for his New York World. Who invented the tabloids can be debated forever. However, the fact remains that it was Pulitzer who left $250,000 in his will to Columbia University to establish that now most prestigious prize. If it was the other way around, we might be talking about the Hearst Prize. The Pulitzer Prize remains one of the most important awards for writing. 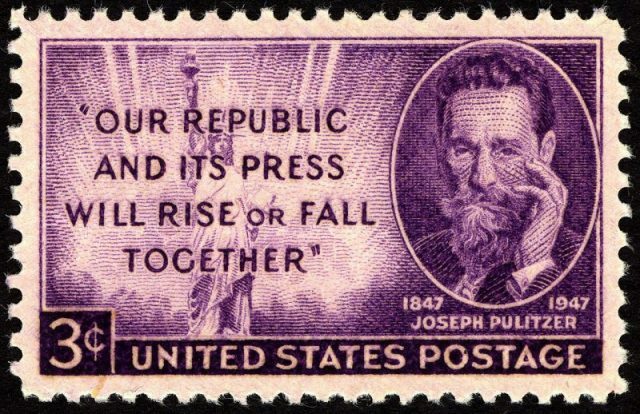 And Joseph Pulitzer made sure that it would be named after him. Whatever his history, the board gives the award based on the quality of the writing itself. This entry was posted in ART, BUSINESS, Europe, History, Hungary, Travel, World and tagged ART, BOOKS, History, Journalism, Pulitzer by rolyred. Bookmark the permalink.